Porcelain is a type of clay mixture used in pottery and other ceramics. It is very hard and very white. Porcelain beads are either colored with a slip and glaze overlay, or a special glaze, or a slip only. 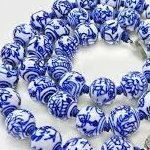 Chinese porcelain beads present that Oriental feeling and sensibility.